Recycling and waste management take on a stunning new look with this contemporary container. Features adjustable leg levelers and easy to lift-off lids. Folding retainer bands hold poly bags inside leakproof plastic liner. Fire-safe steel construction and stylish lid complement any setting. Uni-Koat powder-coated finish creates upscale look. Lid opening fits your recycling need. Top lifts off for easy emptying. Factory applied designer die-cut decal identifies waste type. 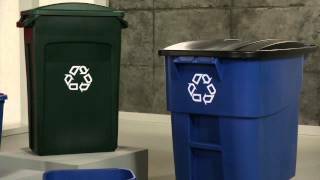 Waste Receptacle Type: Recycling;Drop-In Top; Material(s): Steel; Application: Cans and Bottles.